Great Southern Hotel Melbourne (formerly Hotel Enterprize) provides accommodation in Melbourne's city centre, just a short walk from Southern Cross Station and across the river from the Crown Entertainment Complex. 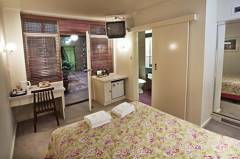 This boutique accommodation offers a choice of 273 rooms in three distinct room types, including budget courtyard, classic courtyard and superior deluxe with all modern and comfortable amenities featuring heating and air conditioning, colour television with cable TV, international direct dial, data communications and high speed internet connection (Classic and Deluxe rooms only), hairdryer, daily newspaper available from reception and tea/coffee maker. The Great Southern Hotel Melbourne (formerly Hotel Enterprize) guest services include multi-lingual staff, limited safety deposit facilities, undercover secured parking (fees apply), tour desk, 24 hour reception, valet laundry service, outdoor courtyard and group facilities available. When it comes to food and guests are looking for something a little different, inexpensive or just plain good value for money, The Great Southern Hotel Melbourne (formerly Hotel Enterprize) have just the right solution in the Jarrah Asia Restaurant and Bar. The Jarrah Asia Restaurant incorporates an impressive array of modern tempting Asian dishes featuring predominantly Chinese cuisine. The Great Southern Hotel Melbourne (formerly Hotel Enterprize) is close to all the Melbourne action and tourist attractions like Etihad Stadium, Crown Casino and Entertainment Complex, Melbourne Exhibition and Convention Centre, Melbourne Aquarium, Eureka Tower Observation Desk, Docklands Precinct - Harbourside Restaurants/Bars, Southbank Precinct - Riverfront Restaurants/Bars, Southern Cross Station and Transportation Terminus, Ready access to public transport, ready access to Melbourne's most fashionable shopping, entertainment, restaurant, theatre, sporting, arts and cultural venues. 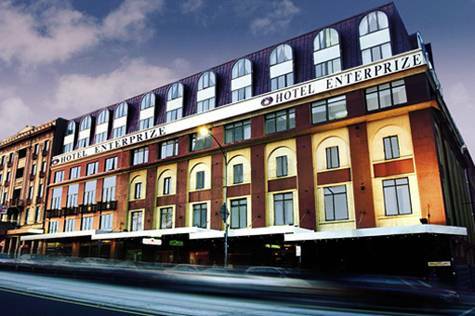 The Great Southern Hotel Melbourne (formerly Hotel Enterprize) is an ideal accommodation choice for both business and leisure travellers. Melbourne (Tullamarine) Airport - 22km. Disabled room(s) available on request (Superior rooms only). Limite car parking available on-site (subject to availability), charges payable direct.